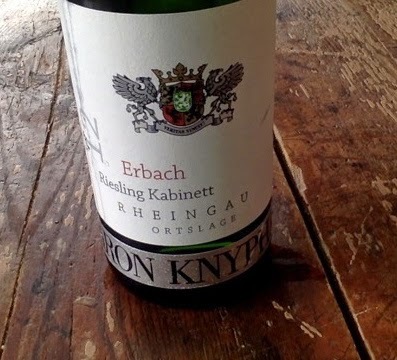 As the spring has officially arrived, mind turns more and more from red wines towards white`s, alas, for me, it´s fair to say, predominantly Rieslings. Theme: value wines, seems to continue here.. This Rheingau Riesling is representing the second step (Ortswein) in the new classification pyramid formed by the VDP(Verband Deutscher Prädikats- und Qualitätsweingüter). And the grapes are coming from the vineyards surrounding the village of Erbach (Rheingau). A bit subdued aromatically (though opened more on the next day): some lemon, petrol, yeast and in the background a hint of petrichor. Quite intensive fruit on the palate: pineapple, some peach, backed apple and lime. Feels maybe a touch sweet at first, but the strong acidity keeps the sweetness in check. It cleans and lift`s the whole palate and fruit beautifully, letting it float on a higher and more elegant level. The acids surely are strong and sharp, but not too violent. After the midpalate happens something quite crude and sudden; the fruit turns to stone. Ok, please bear with me, It really feels that the fruit, which at first attacked intensely, glided and floated, oh so elegantly, through the whole midpalate, just abruptly crashes in to a wall at 200 km/h and breaks. It breaks in to a tiny, fine-grained pieces of limestone, marl, and whatnot. And what is left on the palate, is only a long aftertaste of intense mineral dust storm, no fruit, no honey, no citrus, nothing. Just a stoic Symphony of minerals. Fascinating. But, yeah in my opinion this is about as good as it gets for the price point, for a white wine.